While the less mature will be sniggering at the back of the room and thinking about Katie Price, a true gentleman will know that spit roasting is an outdoor cooking technique used to produce outstanding food. 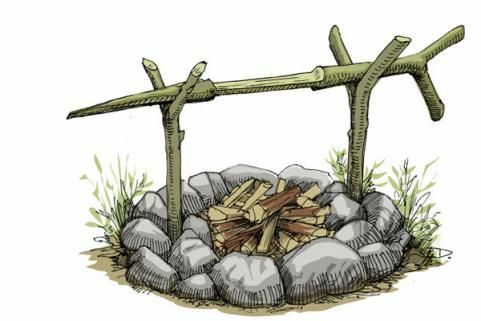 In fact it’s very simple to build; you’re simply taking the idea of using a roasting stick and basic support a little step further in order to be able to roast a larger item that you will have manly killed with a bow and arrow (or bought from the butcher) earlier such as a rabbit. Follow these instructions and you can be acting like Bear Grylls in no time at all. First you need to place a Y support stick that will act as the legs at either side of your fire. Next, with your food already placed through the centre of the roasting stick simply slot each end of the roasting stick onto the Y’s. It’s important to ensure that both of the support ends are planted safely into the ground and that the 3 sticks combined are sturdy enough to hold your dinner. You may want to add some extra support to the Y’s by attaching more sticks to each one, place these into the ground at an angle so they cross over at the base of the Y. When cooking over an open fire with a spit roast, it’s important to remember to keep a close eye on your food to ensure it cooks correctly. Making sure it isn’t raw on one side, doesn’t burn and equally important to make sure you don’t set fire to your actual spit roast.